Ferguson, who wrote the 2018 book The Square and the Tower: Networks and Power, from the Freemasons to Facebook, is optimistic that open societies such as America and other democracies can successfully adjust to the challenges posed by new social networks proliferating through technology. 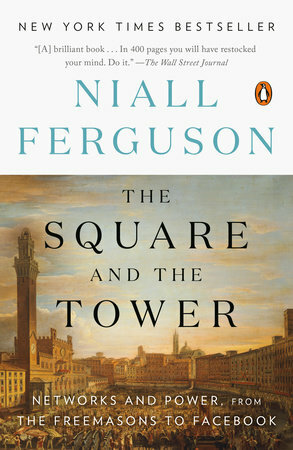 The Square and the Tower will be issued in paperback on January 22. Following is an interview with Ferguson on the subject. What has changed on this topic since your book came out a year ago? Any surprises, new concerns, or flashpoints? It surprised me that, a year ago, many people—including legislators in Washington, DC, as well as journalists in many countries I visited—did not fully understand the scale of the threat posed to civil discourse and the democratic process by the network platforms—Facebook/Instagram, Google/YouTube, and Twitter, in particular. Now there is a much better understanding that something went quite seriously wrong in 2016; that the titans of Silicon Valley did their best to downplay the problems; and that not a great deal has really changed for the better since then. But we still have no consensus on what should be done, which was why I wrote a rather lengthy paper on that subject for George Shultz’s seminar series on governance and technology. Why are social networks and their use of emerging technologies threatening to power hierarchies in society? Social networks are not something invented over the past two decades by Silicon Valley companies. They have always existed and are indeed one of the defining ways in which we as a species organize ourselves. All that has happened in our time is that technology innovations —personal computers, smart phones, and the Internet—have combined to make social networks bigger and faster than ever before. There is a close analogy with the way that the printing press expanded and accelerated social networks in sixteenth-, seventeenth-, and eighteenth-century Europe, except that our revolution in networking has happened an order of magnitude faster. Now, as then, established hierarchical structures—the papacy and Holy Roman Empire then; states, political parties, and established media companies in our time—face disruption. That is not necessarily a bad thing, but we should not delude ourselves that this disruption will be without its collateral damage. A good example is the way online social networks appear to be worsening political polarization in many democracies today. How do power hierarchies flip technology to use it for their advantage in stifling democracy? Just seven or eight years ago, it seemed clear to Eric Schmidt (the former executive chairman of Google) and his co-author Jared Cohen that the Internet was on the side of democracy and would help topple authoritarian rulers. That seemed to be true during the (misnamed) Arab Spring. We all underestimated the ability of undemocratic or semi-democratic regimes to adapt to the new technologies, and especially to find ways to exploit network platforms. Exhibit A has been the way the Chinese Communist Party has made it hard for US companies to flourish in China, encouraging domestic tech companies such as Baidu, Alibaba, and Tencent, which are much readier to cooperate with the government’s policies of social control. Exhibit B is the way the Russian government of Vladimir Putin not only has established state control over social as well as old media within its borders, but also has found ways to exploit the opportunities afforded by Facebook, YouTube, and Twitter to destabilize the election process in the United States and elsewhere. How does a symbiosis between networks and hierarchies lead to stable rule? I am not sure it’s as simple as your question implies. As I show in the book, there isn’t really a clear dichotomy between networks and hierarchies: there’s a continuum from very hierarchical or centralized networks to very distributed or decentralized networks. Neither of the extremes is desirable: one gives too much control to a single “node,” the other runs the risk of anarchy. What is your prognosis for the future of US and Western democracy, given the current tension between hierarchies and networks in our societies? I remain an optimist. Despite all the alarms and excursions around the 2016 election, and the forebodings of those who believe the republic is in danger and democracy in a global “recession,” in truth the outlook remains brighter for democracies (provided they maintain the rule of law and a vital civil society) than for autocracies, or even illiberal democracies. The United States has survived worse than this; American society has been more deeply divided, and much more prone to political violence, than it is today. As for our most committed antagonists—Iran, North Korea, Russia—they are weak, and their repressive regimes are a reflection of that weakness. Even China may be running the risk of overconfidence these days. A one-party state calls into being the biggest bourgeoisie in history at its peril! The societies most likely to strike the right balance between old hierarchies and new social networks will be the open societies, where appropriate regulation of big tech companies is more likely to be worked out than in closed societies.